Cherry City Kitties : YIKES !!! What did YAHOO do ???? Hi Cherry City Kitties!! We are very pleased to meet you!! 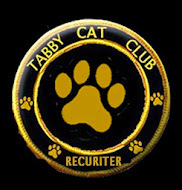 You will meet lots of Kittes at the Cat Blogosphere! Hi! We saw you visited and we came right over! We followed you and Mommy put y'all in out Reader! this is no good. Sorry and hope you get it fixed. Hello sweet City Kitties!! Thank you for dropping by our blog to meet us today!! We look forward to being feline friends! Hi kitties! Its very nice to meet you! We love meeting new kitties and hope you will stop by for more visits with us. Friday we are giving away some excellent kitty toys, so definitely stop by then!